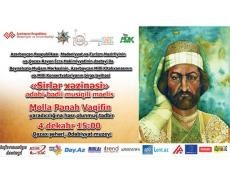 Gazakh Literature Museum will mark the 300th anniversary of Azerbaijani poet Molla Panah Vagif on December 4. The event within the large-scale project "Treasury of Secrets" was co-organized by the International Mugham Center, the National Library, and the National Conservatory with the support of the Ministry of Culture and Tourism and the Executive Power of Gazakh region. Chairman of the Ataturk Center in Azerbaijan, member of the Parliament Nizami Jafarov, director of the Azerbaijan National Library, professor Kerim Tahirli, chairman of the Azerbaijan Ashugs Association, professor Maharram Gasimli, professor Rustam Kamal, chairman of the Karabakh regional department of Azerbaijan's Writers Union, doctor philosophical sciences, professor and poet Anvar Akhmad, chairman of Gazakh regional branch of Azerbaijan's Writers Union, poet Barat Vusal and others will take part in the event, Trend Life reported. Actress of the Yerevan State Drama Theater named after Jafar Jabbarli, Ph.D. in philology, Zulfiya Eldargizi, will read lyric poems and gazelles written by great poet. The founder of the realism genre in the Azerbaijani poetry established himself as one of the most influential Azerbaijani poets. He was also a prominent statesman and diplomat, vizier – the minister of foreign affairs in the Karabakh khanate. His work had a great influence on the further development of national poetry. Notably, a number of events devoted to the creativity of poet and thinker Muhammad Fizuli, Azerbaijani poetess Khurshidbanu Natavan, mugham master Yagub Mammadov were also held as part of the project.